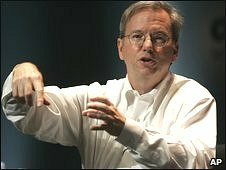 Google chief executive Eric Schmidt has quit Apple's board of directors because the search giant's business is increasingly competing with Apple's. Apple boss Steve Jobs said that had Mr Schmidt stayed on, crossovers between the two firms' projects mean he would have to leave chunks of meetings. Google's Android operating system is used in mobile devices that compete with Apple's iPhone. Google is also developing an operating system based on its Chrome web browser. The Federal Trade Commission has been examining whether Google's common ties with Apple might discourage competition. In May, Mr Schmidt said that he had not contemplated stepping down as an Apple director because he did not see the company as a "primary competitor". The decision for him to depart was a mutual one, Mr Jobs said. "Unfortunately...Eric's effectiveness as an Apple board member will be significantly diminished, since he will have to recuse himself from even larger portions of our meetings due to potential conflicts of interest." Google is beginning to promote its Google Voice service - which assigns a phone number to users, who can let the user divert calls to that number to other phone lines. The US Federal Trade Commission said it would keep looking into the connection between the boards of Apple and Google, after Mr Schmidt left on Monday. The commission's director, Richard Feinstein, welcomed the move. Mr Feinstein said the link between Google and Apple had been under scrutiny for "some time". "We will continue to investigate remaining interlocking directorates between the companies," he added. Both firms are rivals for each other in businesses such as smartphones and operating systems. Last week the Federal Communications Commission wrote to Apple and Google seeking more information about Apple's rejection of a Google Voice application for the iPhone.